Should you buy… the Surface Headphones? Microsoft is globally recognised for its software, but in recent years it has turned its attention to the hardware side of things as well. The Surface line of 2-in-1 laptop tablets has been a slow-rising success for the company, and now Microsoft is making its first foray into headphones – with the Surface Headphones. But with the likes of Apple’s Beats and countless others packing years of experience, does Microsoft’s take have the punch to stand out among a tight crowd or is it too little too late? 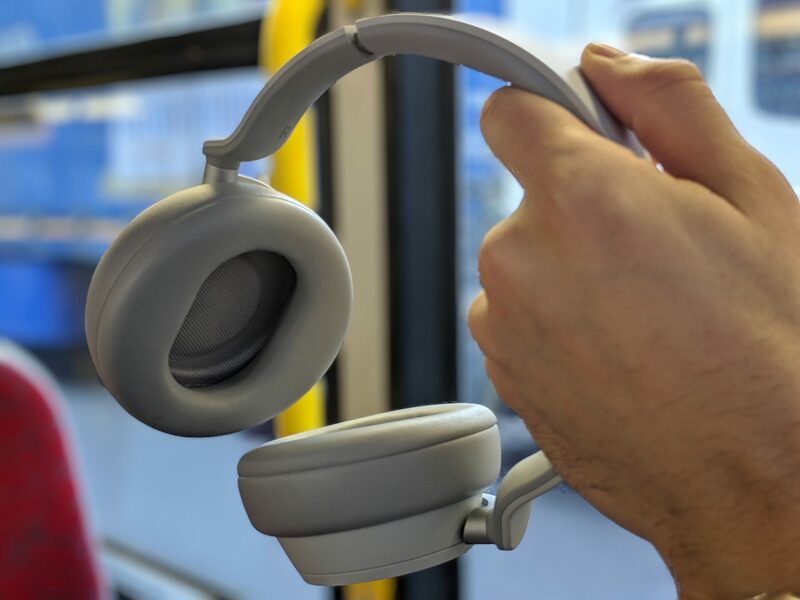 The first thing you will notice about the Surface Headphones is that they do look really beautiful, following a simple but sleek grey colour akin to the main Surface machines, with a discreet Windows mirror logo above each can. Memory foam cushions provide a delighting level of comfort to wrap snugly around each ear. Microsoft says that the material is the same that sumo wrestlers use, providing comfort and sweat resistance – after a couple of hours of non-stop use, there wasn’t any need to re-adjust because of achy, baked ears, which is a good sign, though it would be good to test further on a long-haul flight. The headband along the top has a bouncy plastic surface coating to maintain the good feeling, although the steel used to hold it all in place feels a tad flimsy. You can extend the length by about 3cms on each side, providing plenty of head room and leaving a decent amount of space for the cans to sit on your neck when you’re not using them. 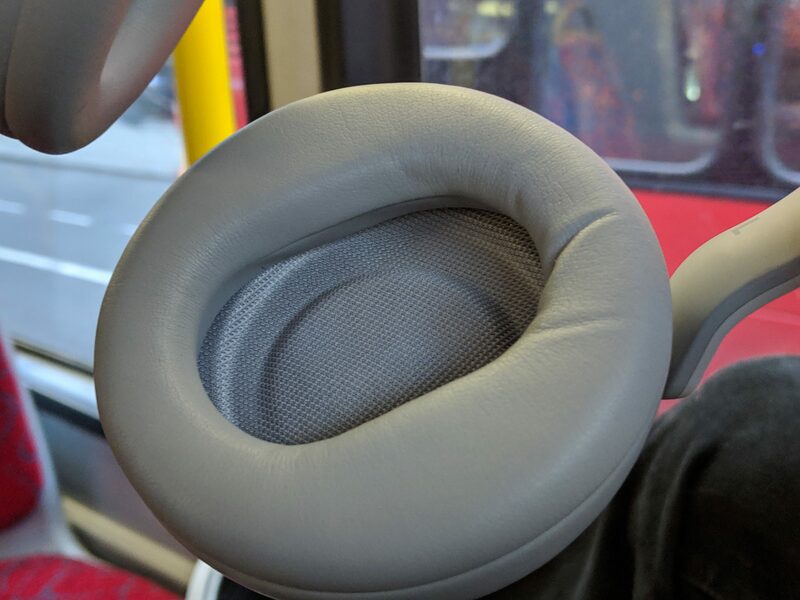 At 290 grams, the headphones feel really light too, so they won’t weigh your head down, or your bag. A handy travel case is included, which is a nice touch but not something most people will probably need in reality. 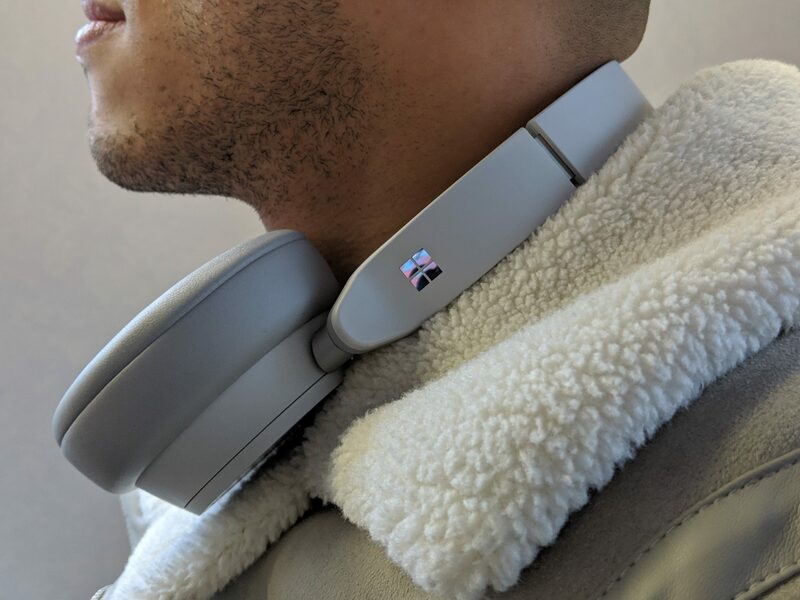 One bug bear you won’t have to deal with when using Surface Headphones is connectivity issues. It’s really easy to connect your device with Bluetooth and the headphones detect them quickly too, so there’s no need to faff around on your phone wondering if there was a problem – to make matters easier, the headphones always start with the battery level and the name of the device you’re connected to, that way you know everything is up and working. The touch-sensitive cans act as your control buttons, reacting rapidly and correctly detecting the touches you make the first time round. There are five touch gestures to choose from, one tap to play or pause, two taps for the next track, three taps for the previous track, and when you get a phone call you can do two taps to answer or end a call, and a long single hold to decline a call. The all important question and main point everyone wants to know is the sound – does it deliver? Microsoft has certainly packed in plenty of volume to play with but the best way to assess sound is to try different song types. Trying Rihanna’s Work, the bass is perfectly overwhelming without drowning out her voice – and doesn’t vibrate your head. A ballad like Celine Dion’s The Power Of Love maintains strong vocals and immersive instrumentals. And down the rock route, Papa Roach’s Last Resort allows the instruments to rightfully dominate the vocals. Overall, the sound quality is good – but on par with many other headphones on the market. That said, noise cancellation is where the Surface Headphones excel, doing a great job excluding external sounds. 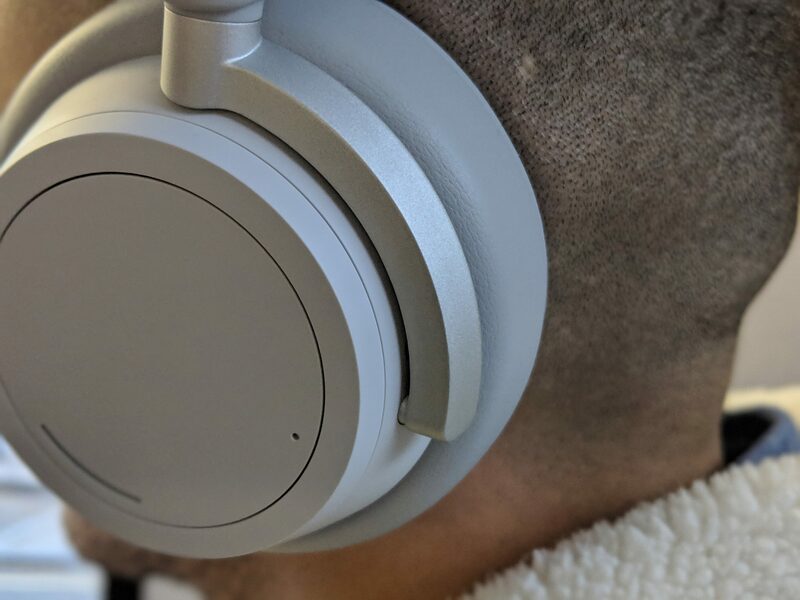 Microsoft uses a dial on the left can that controls the level of noise cancellation by 13 notches – when turning the dial it feels more like a simple on/off with no real progression between the 13 levels, but it still excludes and includes noise sufficiently. One notable issue on the sound front, is that excessive movement causes the netting on the speaker to distort the sound, which is annoying when cyclists are among the audiences Microsoft is pitching Surface Headphones to with its noise cancelling technology. Battery is one of the Surface Headphones’s shortfalls, offering only 15 hours of playback with active noise cancelling on, whereas many cheaper players such as Sony offer up to 20 hours. On the upside, USB-C charging means you can recharge pretty quick, getting enough juice for an hour’s worth of playtime within just five minutes. Microsoft’s first attempt at headphones is a good start, but needs some work in the battery department to at least match its rivals – as well as something to give the sound more oomph and really stand out from a very crowded market. 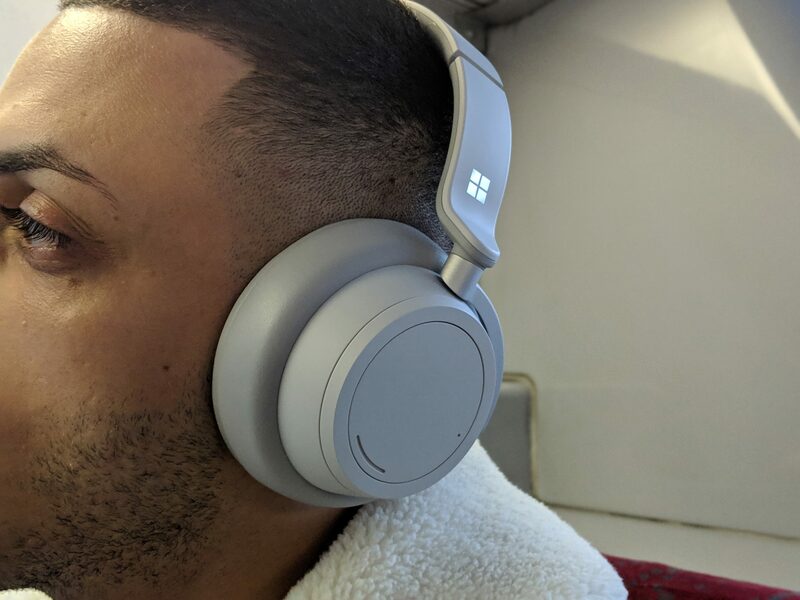 As we’ve seen with the Surface tablets, Microsoft is capable of learning and improving, so there is some hope for the Surface Headphones to become a stand out product, but it’s not quite there yet. Design and comfort wise, these headphones nail it, as does the noise cancelling. 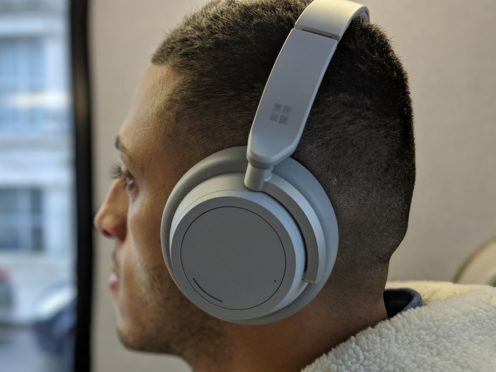 Ultimately, it all comes down to price, and at £329, Microsoft is asking for quite a lot when they are the new kid on the block in headphone terms – and there are plenty of other wireless headphones that perform just as well at a cheaper price point.